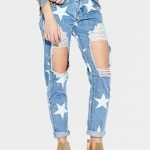 We all know that womens ripped jeans are very popular and all-matching, so it is really a basic item for us, today I’m here to bring you two classical collocations about ripped jeans. We usually don’t wear ripped jeans in winter, but it will be warm soon, so we talk about its collocations in other seasons. 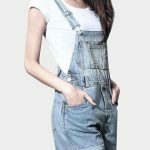 It’s very hot in summer, the fabric of the jeans should be thin and has good air permeability, and we can choose a black camisole and team with a big ripped jeans on the part of knee and a pair of black stilettos, which combination is not only fashionable but also cool in summer. As for in spring and autumn, the weather is pleasantly cool, which is more suitable to wear jeans, so we may as well put on a bright color shirt, like yellow, it better have sense of design to show your style, the jeans can be dark blue and paired with high heel boots. This outfit is fresh and young, especially the yellow shirt, which belongs to warm colors. Of course, these two examples is very basic, you should be more flexible in order to show your own creativity. How to Dress Outstanding with Jeans?